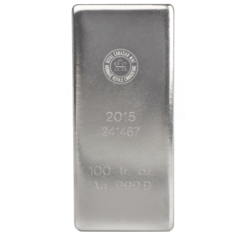 With GoldBroker, you can purchase silver bars produced by recognized refiners certified by the London Bullion Market Association, such as Johnson Matthey, Republic Metals Corporation and the Royal Canadian Mint. Bars never leave the professional storage units from the time of fabrication, which guarantees purity of at least 99.5%. Your investment maintains its maximum resale value. The great abundance of silver, as opposed to the comparative rarity of gold, means that it is less expensive than the yellow metal. The silver bar requires the least amount of processing of all incarnations of the precious metal, therefore asking the lowest premiums added to the spot price. 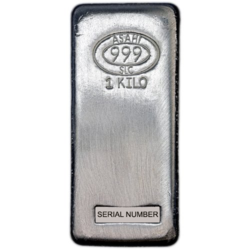 The largest silver bar, the 1,000 ounce Good Delivery bar, is the most economical, being the wholesale unit of exchange. Retail bars are made for investment purposes (and for industrial use – glass coatings, alloys, electronics, etc.) in 100 ounce and 1 kilogram sizes. These carry larger premiums but are still more margin-friendly than coins. GoldBroker.com will facilitate for you the direct ownership of high value, lowest-possible premium silver bars for the purposes of profit and wealth protection. At the refinery, molten silver is poured into open molds made from graphite or cast iron and then cooled. Or an extruded process may be used, in which the metal is heated and forced through a rectangular space to create a uniform length. Exact methods are closely guarded secrets, as each refiner has its own unique way to produce a bar that responds to the realities of its feedstock and business plan. What is common to all processes is that each bar is finished with a stamp of its weight, fineness, refiner’s seal, and unique serial number. From this moment, a silver bar procured by GoldBroker is tracked, its whereabouts known and accounted for until you take possession of it, in your full name, with a certificate of authenticity. This ensures it retains full market resale value if or when you decide to liquidate the asset. And we deal with London Bullion Market Association (LBMA) approved refineries only. This is essential. NOTE: It is also important to specify that the London Bullion Market Association’s Good Delivery List deals strictly with the industry standard Good Delivery Bar (mentioned at the top of this page). This is, for the reasons given, the best value for your investment but, by no means, is it your only choice. Smaller silver bars are also excellent investment options and this is why GoldBroker deals only with producers that offer these formats and are accredited by the LBMA. We place our trust exclusively in such entities (US Mint, Royal Canadian Mint, Austrian Mint, Republic Metals Corporation, Argor-Haraeus), and so should you. Silver, the precious metal that is at once common and extraordinary, is a fundamental component of any investment portfolio. 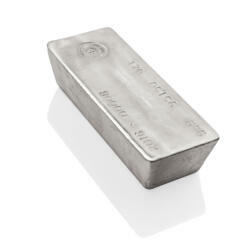 GoldBroker.com is your guide to putting silver bars to work as a solid element of your wealth protection plan.